The Marquetarian is a veritable mainstay of the Marquetry Society. As it states on it's front cover, it is the "Journal of The Marquetry Society" and has been in existence in one form or another since the formation of the Society in 1952. In those early days it was produced as a duplicated sheet (or sheets according to the amount of content) and it was yet to be another couple of years before it was produced in the booklet format we have become so used to. Those early Marquetarians didn't even contain any illustrations at all except for a small design on the front cover! The Marquetarian has certainly come a long way since those early days. Today's magazine is produced to the highest standards that are currently available. Compiled on Mac's and PC's using the latest version of the industry standard "QuarkXpress" publishing software, it is now edited by Alan Mansfield who has recently taken over the mantle from that most respected of erudite Marquetarians Ernie Ives. Ernie edited the magazine for thirty years, taking over the editorship from Max Newport in the late 1970's. 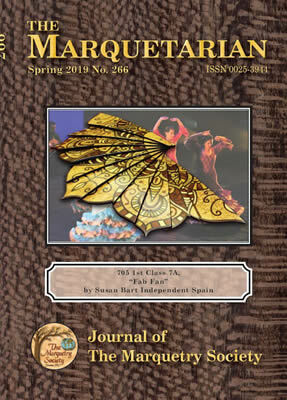 Ernie has edited well over 120 issues of the quarterly produced magazine and has introduced many improvements in that time, notably full colour reproduction of marquetry exhibits and plenty of instructional articles. Alan certainly intends to do his utmost to keep to those high standards that Ernie set; from the look of this Spring edition, it looks like that goal has been admirably achieved. There is only one problem with the magazine and it is this; we are afraid that the only way you can get your hands on a copy of The Marquetarian is by becoming a member of the Marquetry Society! it is an exclusive publication after all - and how about this for a recommendation: around 99% of the readers of the Marquetarian keep every issue they have ever received, they never throw them away! how many magazines can you say that about? So then, let's take a look and see what you will find in the Spring edition of the Marquetarian. 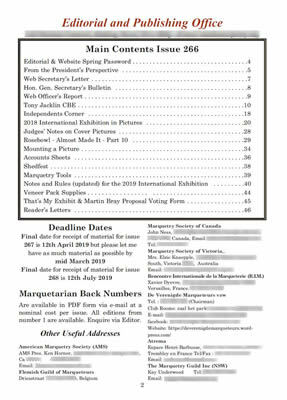 This Spring edition of the Marquetarian has loads of articles which we are sure will educate and please you in equal measures. There’s plenty for you to enjoy and learn from in this Spring edition of the Marquetarian. For instance there is a totally absorbing article about one of the newest members of the Marquetry Society. This new member is a world famous professional golfer who practices marquetry as a relaxation from the pressures of being a global celebrity. The work this new member produces is truly amazing, it is of such high quality. Not only that, the style of the work is unique and almost identifiable as the work of this marquetarian - a very enjoyable article and a good insight to the work of a professional sportsman. You can meet our new Independents' Members secretary in this spring edition of The Marquetarian. We have spent quite a while waiting for the best candidate for the Independents' Secretary to come along - but late last year a well qualified candidate came along who suited the post superbly - and was, of course, appointed. Do read our new "Indies Sec" article to see the benefits the appointment will bring. For those new to the art of marquetry, we bring a new series on the basics of marquetry. This first tutorial covers the often asked question of, how do I make accurate mitres, add stringers and line up my 'lay on' to the baseboard. Those questions are answered here. Ever heard of "Shedfest"? - well that is woodworking festival where the Marquetry Society was represented by the Cotswold Group. And didn't they do a good job of it all. A very successful exhibition of the wonderful and and craft of marquetry - well done the ever talented Cotswold Group. The updated notes and rules for this year's International Marquetry Exhibition are included in this spring edition of The Marquetarian. If you will be submitting and entry or two to the exhibition, it is well worth checking out the rules for any changes in your submission class - you don't want to be marked down for a miss-interpreted rule! And don't forget the "Rosebowl - Almost Made It" series by Gordon Richards. This is yet another must read series which explores and investigates the marquetry pieces over the years which almost made Rosebowl status in their year of exhibition. A well researched series. We then bring you the tenth edition of our very useful identification chart of veneers which are all unusual figuring and grain patterns. These are all genuine examples taken from veneers with odd characteristics in our veneer reference library and they are all featured in accurate colours. This series will provide a rather helpful guide for you when comparing veneers for your chosen marquetry project. Each veneer example featured is taken from accurate scans of the genuine veneers and carefully colour balanced against the actual veneer itself in order to ensure it matches both the printed and true veneer as far as modern technology will allow us. But, and then again, don't forget our regular 'Readers Letters' 'Chairman's Chatter' 'Independents Corner' and much, much more. So, as is always the case, we have yet another excellent issue for your perusal!.